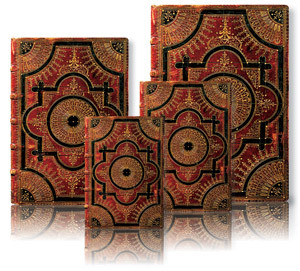 We are pleased to announce our newest collection of exquisitely designed and finely crafted writing journals. Introducing: Baroque Ventaglio. Our cover displays a rose window surrounded by a design of slight eastern influence, and in each corner a filigree fan – the window quartered. This intricate ornamentation is typical or Italian Baroque and is inspired by a French style – à la fanfare — which gained popularity during the first half of the 17th century. This richly layered, decadent blank journal is an ideal place to preserve inspired contemplations. Available in multiple formats (Ultra, Grande, Mini, Midi) and with either lined or unlined pages.